Often described as a cat and dog all-in-one, the Lundehund is a unique combination of independence, affection and charm. Never one to let anything stand in its way, the Lundehund will use its extra toes to navigate climbs and the breed has even been known to let itself into small animal cages to catch the contents. Potential owners should note that due to their history as a hunting dog, it is unwise to have this breed around small animals and birds as they are likely to catch and kill them. Extremely stubborn, the Lundehund requires constant mental and physical stimulation with positive reinforcement training and short, engaging lessons. Highly independent, don't be surprised if your Lundehund is often busy exploring and too busy for you. 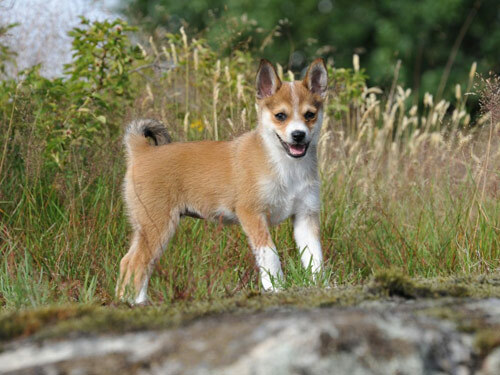 One of the more difficult breeds to keep, the Lundehund is not recommended for apartment dwellers or novice dog owners. The Lundehund loves to bark and will bark at anything it deems important, making it unsuitable for living quarters with noise-sensitive neighbors. Additionally, it is difficult to house train a Lundehund; though some have met with success, the greater number have simple had to adjust their living standard to include things like easy to clean floors, diapers, or puddle mats. It is not unusual for the Lundehund to cache, or hide, its food and owners should be careful to limit time with the food bowl so that their dog is discouraged from socking food away for later. Grooming is fairly regular; weekly grooming is recommended with daily grooming during shedding seasons. Due to the small gene pool associated with the Lundehund, this breed is highly disposed to gastro-intestinal disorders including chronic gastritis, inflammatory bowel, intestinal lymphangiectasia which causes distention of the vessels carrying lymph fluid, and PLE or protein losing enteropathy which allows proteins to leak into the intestines. These dogs may have no disorder, one, or multiple and potential owners should take care to learn the genetic history of their puppy, associate themselves fully with the signs and symptoms and hurry their dog to the vet if symptoms such as vomiting or lethargy appear without warning. This pint-sized puffin hunter has been invaluable to the people of Lofoten Island, Norway for centuries. Scrambling over steep cliffs, the breed became more valuable than cattle as it helped secure not only meat, but down necessary for clothing and blankets. A single dog had the potential to scramble over steep, slippery cliffs and bring in as many as 50 birds a day. In the 18th century, hunting styles changed and the dog began to go out of style, almost disappearing as the puffin became endangered. Their population was decimated in WWII and by the end only six of the dogs remained in existence world wide. A new breeding program was started and the breed is now beginning to grow in popularity throughout the world.